It was the grub GIs loved to grumble about—not because it wasn't tasty, but because it was always there, sometimes three times a day. The 20th-century Chinese writer Lin Yutang once defined patriotism as the memory of what we ate as children. I grew up in the years immediately following World War II, and some of my most vivid memories are set in my family’s kitchen. I can still see the green tiled floor and the chrome-and-Formica dinner table. I remember the food I ate there. In particular, I recall the smells and the tastes of two meals that my mother served with well-planned regularity. 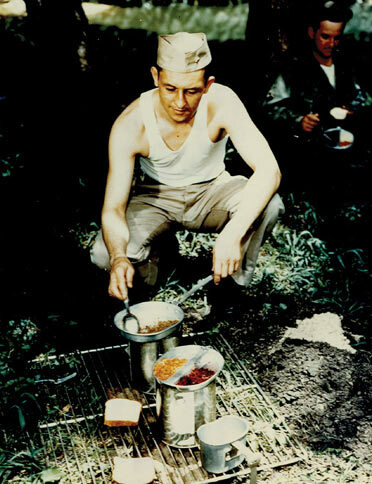 The first was a dish served mainly for breakfasts, which my father, an Eighth Army Air Force vet, tactfully called “poop on a shingle.” (I think I must have been a teenager before I heard the uncensored military slang for creamed chipped beef on toast.) The second one often made its unmistakably rectangular appearance at dinner: in a word, Spam. Say that word to a WWII veteran, and you’re in for a true gut reaction. My own memories of Spam and the frequency with which it appeared on my plate are only a faint shadow of what the so-called “miracle meat” brings to mind for those who ate it seemingly three times a day for the length of their military service. For many, it must have seemed as though there were no food other than this ubiquitous, gelatinous, pink, canned concoction. 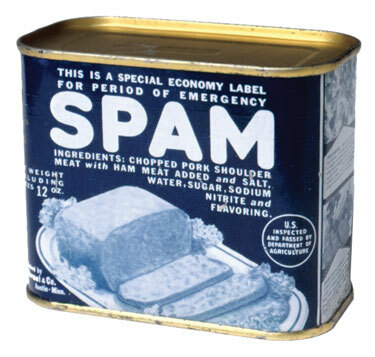 In fact, the Hormel company had celebrated Spam’s birth not long before the war, in the mid-1930s. It was developed not in response to a prophetic vision of the need for a non-perishable, easily transported military ration—nor, as some may still think, as a practical joke played by someone in the US War Department—but in response to the vision of one man, Jay Hormel. President of the meat packing company that shared his family name, Hormel had already introduced canned ham to the American consumer. Now, looking for a way to turn previously discarded pork shoulder meat into a marketable product, he hit upon the idea for an inexpensive canned luncheon treat that fit the budget of Depression-era housewives and had a much longer shelf life than other meats. 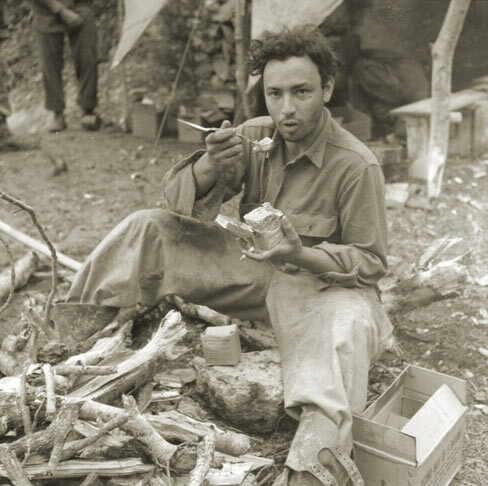 When America entered the war in 1941 and began shipping fighting men overseas, military officials bought large quantities of Spam for the same reason housewives bought it—it was cheap, easily transportable, had a long shelf life—and yes, it was fairly nutritious. But Spam was not the only canned meat to go to war. According to Wyman, the army initially bought 10 different varieties of canned meat to feed the troops. That number grew to 60 by the war’s end. These products found their way into K and B rations (field and communal rations, respectively), where Hormel’s pork shoulder ended up cheek-to-jowl with its competitors’ canned pig ears, noses, and tongues. Soon, the troops were eating these dubious delicacies as often as three times a day. To fed-up servicemen, it was all Spam. Hormel made a doomed attempt to point out the misconception. But to disgruntled troops who’d had more canned meat than they could stomach, the effort only fanned the flames of discontent. And this one moves on Spam. The armies of America’s allies moved on Spam, too. Along with tanks and destroyers, the list of wartime products that America provided to Allied nations through the Lend-Lease program included Spam. On the whole, the British and Russians took more kindly to the omnipresent canned meat than GIs did. A veteran rifleman of the US 4th Infantry Division remembers how he and his mates were complaining about army food during the Normandy campaign in 1944 when two visiting Brits, without a word, lifted a slab of meat from the Americans’ mess, dropped it in the dirt, and then picked it up and swallowed it. The message was clear: You pampered Yanks have nothing to complain about; this is a treat compared to what we get. Sentiments of this kind elicited mostly sneers from Americans in uniform. Trying to put a positive spin on Spam, Hormel circulated an advertisement depicting a letter purportedly from a former Hormel salesman now serving in the Pacific. The letter read, “Boy! You never fully realize how delicious and good Spam really is until you taste it out here in the bottom of a fox-hole. All the boys out here think Spam is the best meat product in the world.” The ad brought howls of derision from GIs. By war’s end, the military had bought, shipped, and served roughly 150 million pounds of Spam. How much of it was actually eaten will never be known. Rumor has it that soldiers sometimes used it to grease gun barrels, but I’ve not found a veteran who attested to having done so. Bruce Heydt is a former editor of American Heritage magazine. This article originally appeared in the June 2006 issue of America in WWII. Order a copy of this issue now. Photos, top to bottom: GIs in a boxcar eating the dinner portion of their three-meal Field Ration, Type K; the unmistakable profile of a can of spam; an ad from the Spam-funded George Burns and Gracie Allen radio comedy The Hormel Program; Sergeant Arnold Bourdreau eating canned corned beef in Italy in 1945; a GI heating a meal that just may include Spam during stateside field exercises. Photo credits: National Archives; courtesy of Hormel Foods Corporation; courtesy of Hormel Foods Corporation; National Archives; National Archives.